Like Animal, we don&apos;t really want to talk about the chances of Banksy showing his "face" at the Academy Awards on the 27th. Come on, now. However, it does seem like the world-renowned street artist is in Los Angeles right now, after this likely piece of his cropped up. Who did the first spotting? 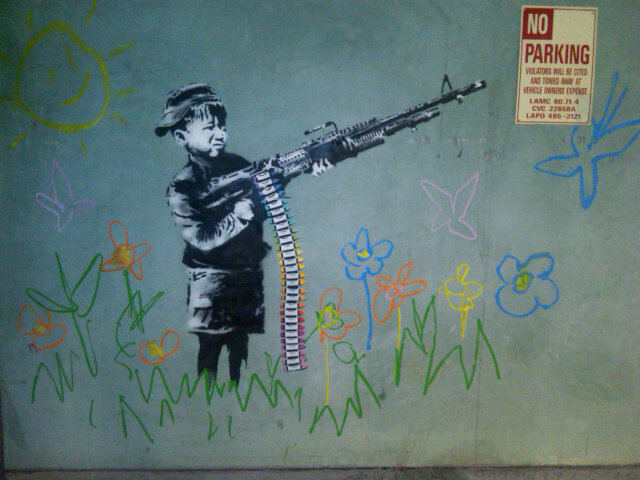 None other than local "personality" Lauren Conrad, who Tweeted this shot of it last night, asking: "Is Banksy in LA?" Jetset Graffiti says this piece is called "The Crayola Shooter," but won&apos;t say where in town it is.